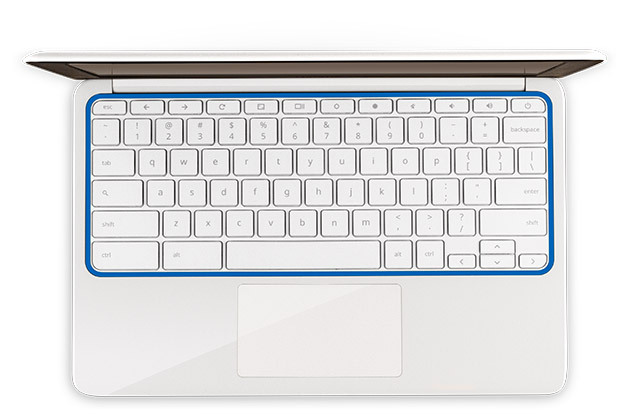 Google unveiled a new addition to its growing stable of Chromebooks today, the HP Chromebook 11. The $279 device is on sale now, and offers a white plastic case that’s reminiscent of Apple’s white MacBook, but with color-splashed variants which draw from the palette of the Google Chrome logo to spice things up a bit. The new Chromebook is a lot more like Google’s other offerings with partners including Samsung and Acer, and unlike its top-tier flagship model the $1600 Chromebook Pixel. The HP 11 is aimed at a different market than the super-powered Pixel, but still offers a lot of the same benefits and value as its higher-priced cousin. The 11 is remarkably light, too, at just 2.4 pounds, and what’s actually amazing is that it uses micro-USB to charge – yes, the same charger used by just about every Android smartphone and tablet in existence, as well as most modern mobile devices. So the charger it ships with in the box can also be used to power your Nexus 4, should you need it. The laptop gets a reported six hours on its built-in battery, which is respectable, if not on par with today’s all-day batteries in laptops like the MacBook Air. Other highlight features include the 11.6-inch IPS display, great for a device this cheap, as well as a magnesium frame that supports the plastic exterior and should make it pretty durable. HP is also pretty proud of the speakers, which reside under the keyboard in order to provide better sound, but we’ll reserve judgement before going ears-on. The whole thing is powered by a Samsung Exynos 5250 processor, so it’s not going to be doing any heavy-duty video processing, but you’ll be running Chrome OS so there’s little hope of that anyway – unless you set up a dual-boot to Linux situation, which, speaking as a Chromebook owner, you definitely should. For those curious about the HP Chromebook 11, it’s probably still at a stage where those who get the most benefit out of this device are users who live in the browser, and never venture out for anything. But Google is pushing the development of Chrome and Chrome OS at a rapid clip, so it could become more broadly appealing fairly quickly. If you’re still ready to dive in, Google says this is on sale now at Best Buy, Amazon, Google Play and HP’s online store in the U.S., and at Currys, PC World and other places in the U.K.